In the golden years of your life you’d like to live somewhere comfortable, with a sense of independence, and that’s what Continuing Care Retirement Communities (CCRCs) are all about. CCRCs are ran with the residents in mind offering medical services, outdoor activities, dining options, and much more while still giving the residents independence to make the decisions they want to make. Among the wide range of housing and care options available to seniors there’s an ever-growing popularity in continuing care retirement communities, and for good reason too! A CCRC isn’t an independent living community, assisted living facility, or a nursing home ­– it’s a combination of all three. The assisted living aspect of the CCRC is intended for the residents that are living there, they are not for seniors that live outside of the community. As with any other type of assisted living facility, the residents will sign a contract detailing exactly what services they need and will receive. This would be everything from what type of condo they would be living in to how many times they’d be visiting an on-campus nurse. One of the most attractive aspects of a CCRC is the range of healthcare benefits, including supportive services, that is included within the limits of a basic contract. These may include nursing, social work, dietician services, physician care, pharmacy, and various therapies for residents who may experience short spans of illness or have an on-going problem. Beyond that most CCRCs have a variety of other on-campus activities that would be included in the contract. This would be services such as housekeeping, laundry, and meals served in the dining facilities! While health is a major focus of CCRCs they go above and beyond by making sure that the residents really feel at home, while also making sure they have plenty of fun activities to do. The activities would normally include such things like golfing, dining, shuffleboard, Wii Bowling, among other things. Are You or Your Parents Ready for CCRC Living? The main goal of CCRC living is to provide residents a “user-friendly” environment that they’re able to maintain their independent routines and tasks in. That being said, CCRCs also care to residents who may grow more dependent as time passes, giving you ease of mind knowing that you always have a neighbor that cares and will help. CCRCs independent living setting gives you the freedoms of a private home, with none of the property maintenance or isolation that comes with living in a house! 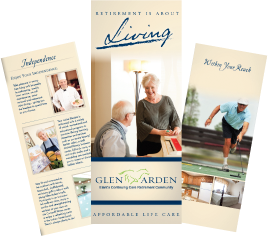 Here at Glen Arden, we understand the need for a full, independent lifestyle while having the peace of mind that assistance is just a call away. If you or a loved one is interested in CCRCs and would like more information please call us at 845.360.1400 or email us at info@glenardenny.com.